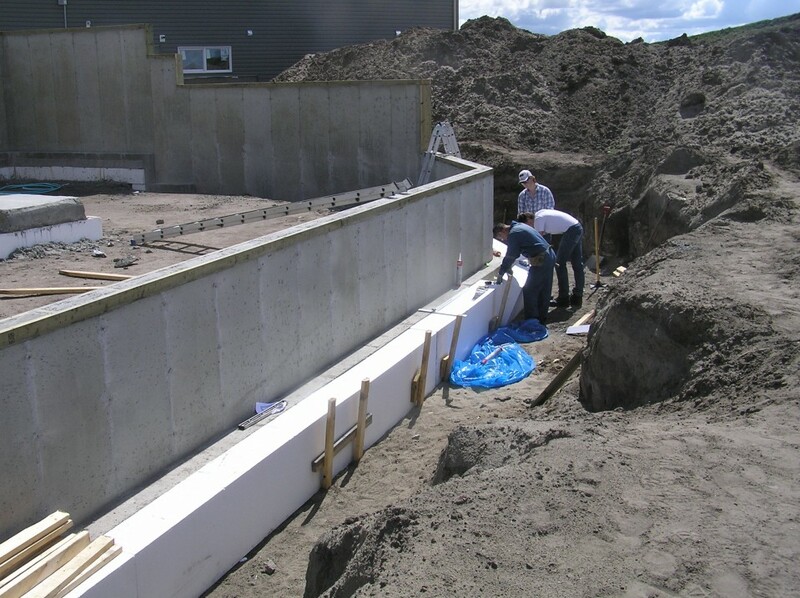 With the foundation in place, the next step is applying the 12″ thick EPS insulation to the outside face of the concrete. 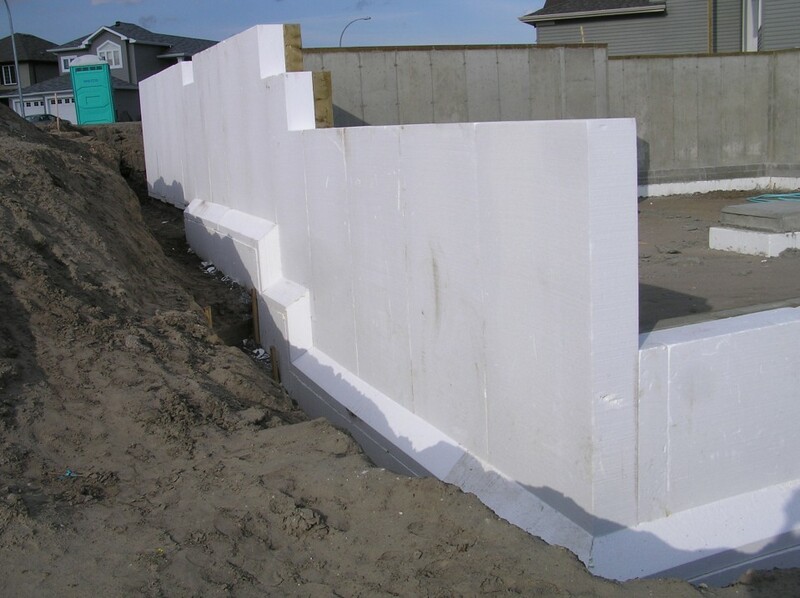 (EPS is Expanded Polystyrene, often called bead board. It is a cheaper alternative to a related material called XPS, or Extruded Polystyrene, at the expense of a slightly lower R-value.) 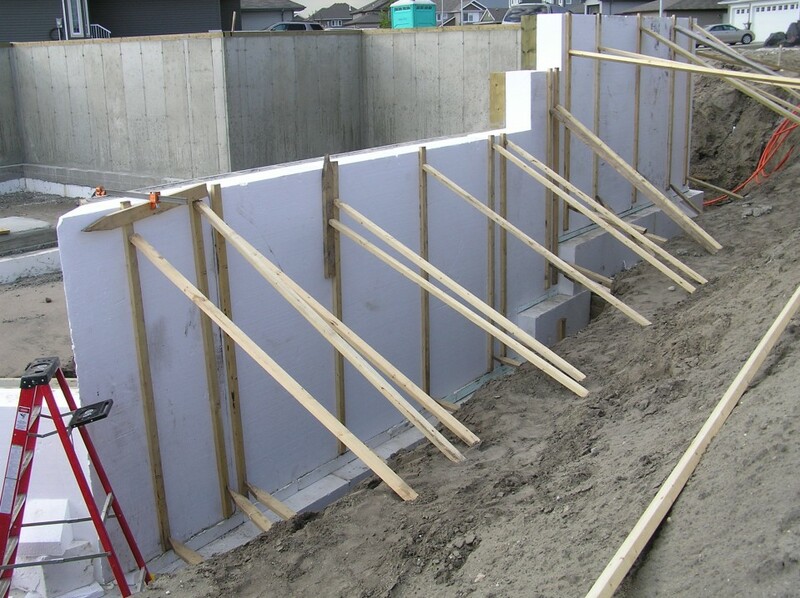 The insulation is glued to the foundation wall, and then covered with a waterproofing material to prevent damage to the insulation or unwanted water ingress. This is the insulation stash! 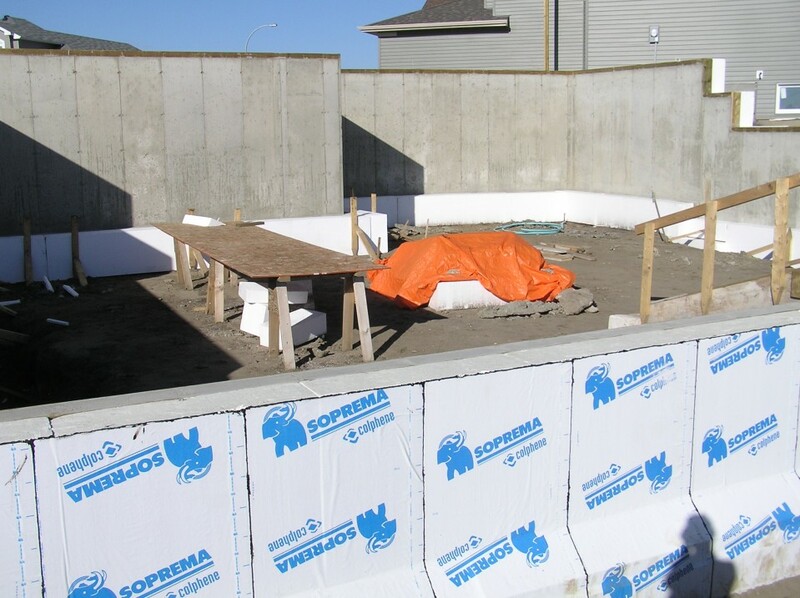 This is the entire insulation package, excluding the sub-footing insulation already installed: foundation walls, footing sides, and under-slab. 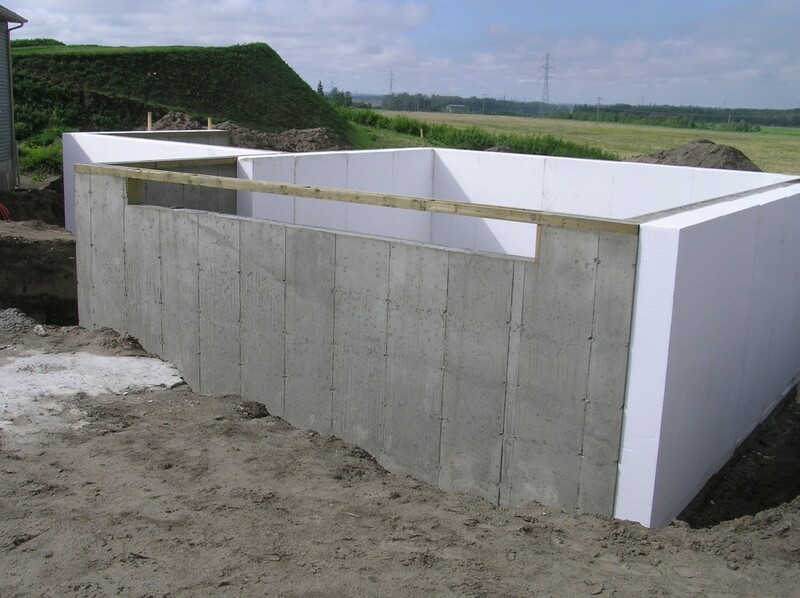 The footings are thermally protected on all sides. Concrete has a fairly poor R-value, so thermal bridges to the surrounding soil can be significant if you imagine the soil sitting at a constant ~8-10˚C all year, continuously sucking heat out of your house. 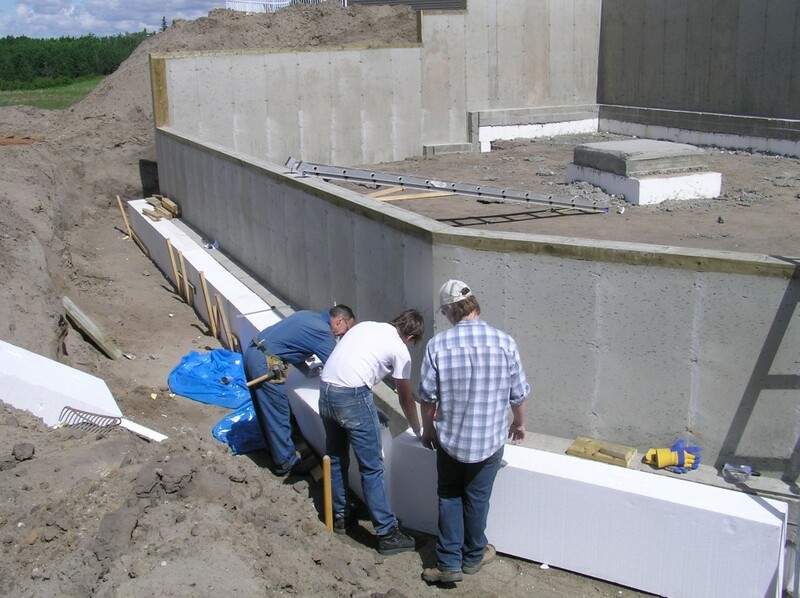 This strategy is somewhat different than many other Passive Houses that use a “raft slab” technique to insulate from the ground. 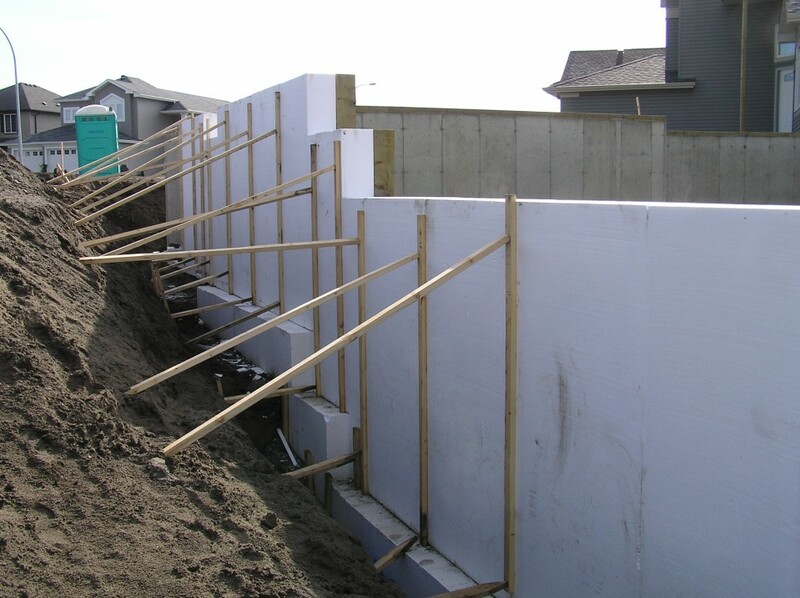 The frost protection depth in this part of Alberta requires foundations to typically be 8′-0″ below grade. 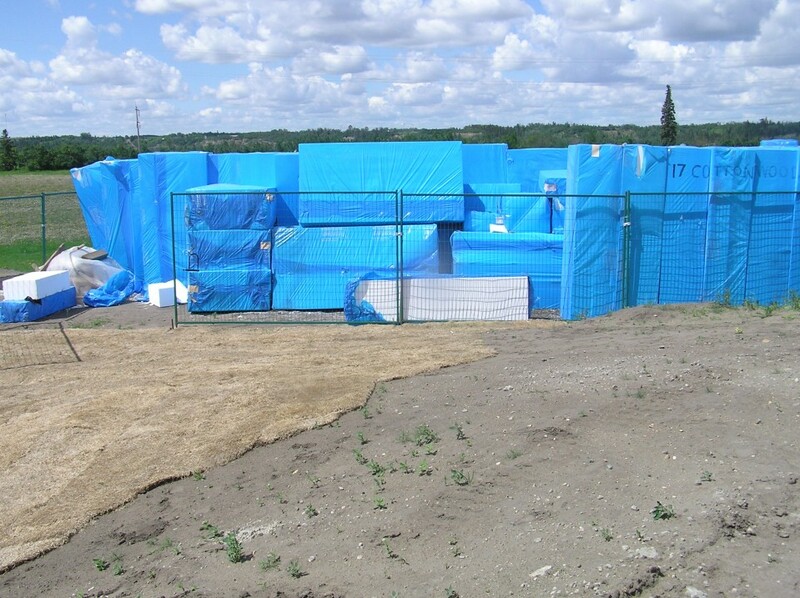 We’ve gone shallower to save material and money on concrete and insulation, though we’ll add an insulation skirt for additional frost protection once backfilling is underway. The crew hard at work, applying glue to the EPS. This is a view of the rear walk-out portion of the house. The top of the wall in the foreground will be roughly ground level when the house is complete. 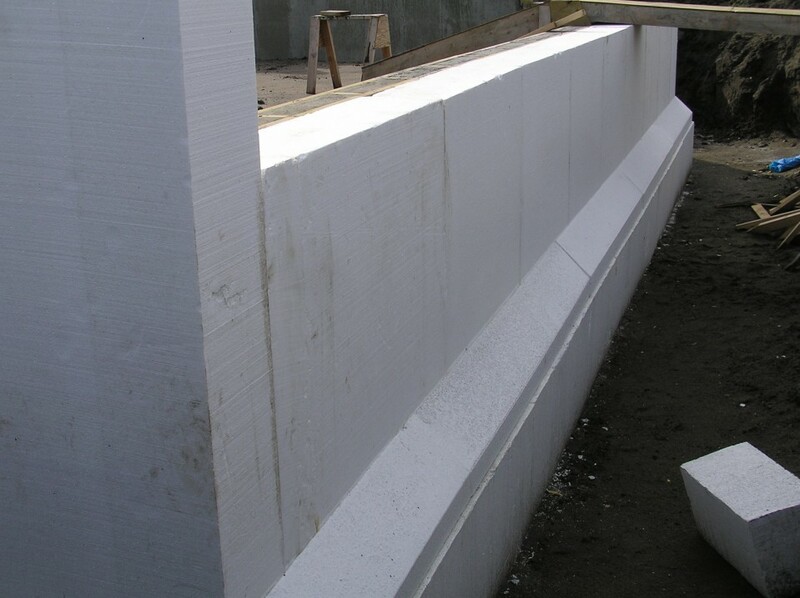 Close-up of the wall insulation being applied. 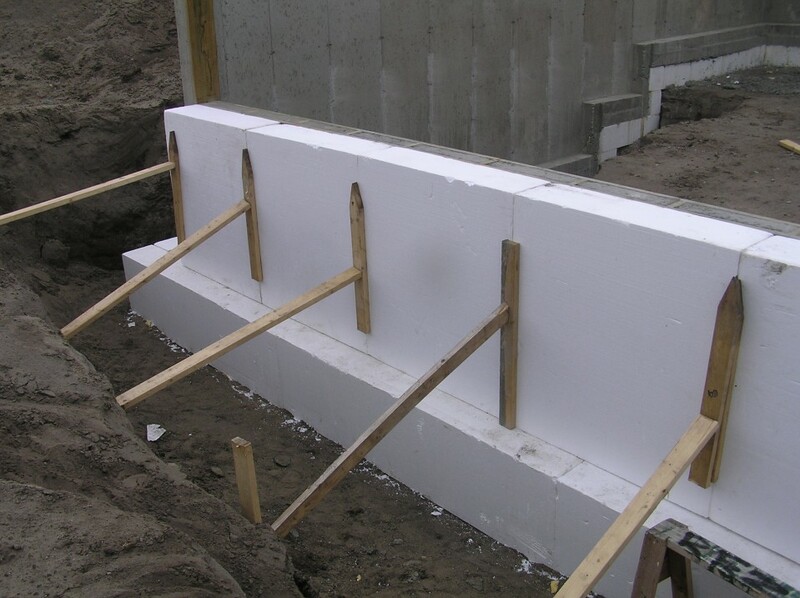 Detail of the shaped EPS profile at the footing, providing a continuous 12″ insulation layer around the footing. The northwest wall with profile attached. And a view from the front, showing the insulation on the inside of the garage. For the purposes of meeting the Passive House criteria, the garage is outside the thermal envelope of the house. The insulation is also applied to the interior as well. The basement slab will be well-insulated from below in pictures yet to come. What have you learned from this project that you would change on your net one? This is a very good question and I agree with David re: it would be an entire post. Just some first thoughts though. I would go with a raft slab in the future instead of a footing separate from the slab. The EPS should be interlocked like T&G. In our case it wasn’t, leaving small gaps between pieces that needed to be filled later. I had a really good cribber, but he kind of did his own thing and didn’t follow the plans exactly. This resulted in me having to do a lot of EPS cutting which is no fun when it is 12″ thick. The wall assemblies worked well although there would be improved efficiencies of prefabbing these as mentioned above. Reduce the amount of gusseting as the walls were extra strong. One thing I would change is the use of the SIGA Rissan tape for air sealing. This tape is excellent to work with. We did a preliminary blower door test and ended up averaging 0.15ACH which exceeded our expectations. I would not change the quality of windows neither. They are fantastic. Jim, Dave, I’m absolutely etatic over the execution of this project. There are many Passive House projects appearing on the net and I must say that most are lost in what they think is the correct approach to the final outcome. 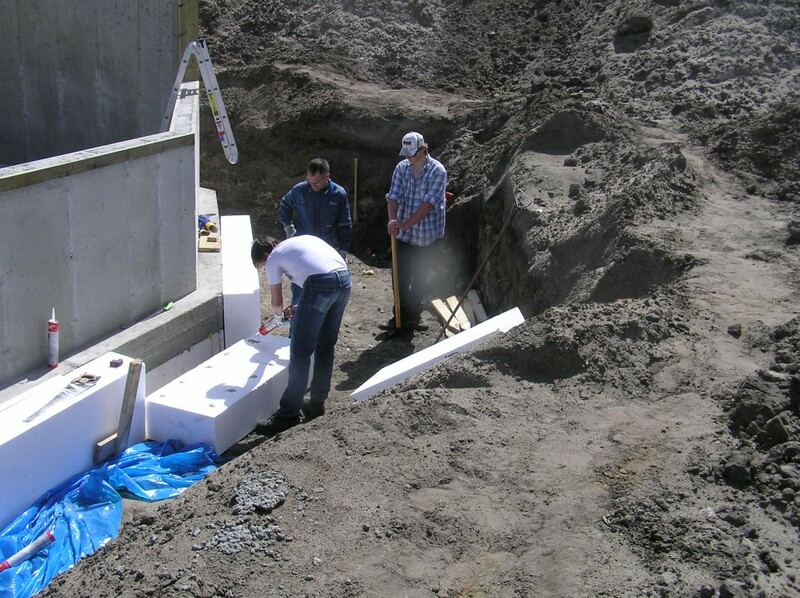 The use of EPS is in my mine one of the most important choice of materials that the Architect and Builder has in their toolbox. That said the understanding of how this seemingly odd building material is used to its best potential, is where some get it wrong. If we cam use it for airport runways and floating house foundations, everything else is a cakewalk. sequences that I would be happy to offer if you need some ideas strengthened for future projects. EPS is indeed a wonderful project. It is easy to shape and form and has so many potential uses. I worked in a styrene plant early in my career and had a good experience with it. It was definitely interesting to hear people’s comments when we said that we put it under the footings. As this is our retirement home, I’m thinking this might be my last project, but one never knows.